Free Growth Gear Shapes for PowerPoint comes in handy while making work process presentation to show corporation and teamwork. 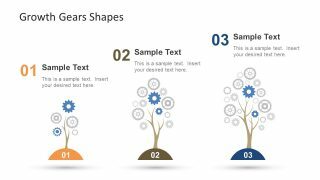 The flat design vector PowerPoint provides the illustration of tree diagram unify with gears clipart. The diagram is helpful in depicting processes ideas, their relationships and technology. Additionally, assists in creating an impressive presentation using objects as metaphor for development and progress. Although, visual presentation of machine parts assembly symbolically shows change in direction to perform specific tasks. It is also a metaphor for business planning, engineering process and brainstorming. Therefore, ideal for creating quick slides with graphical content. This aids in better engagement and lasting impact on audience. 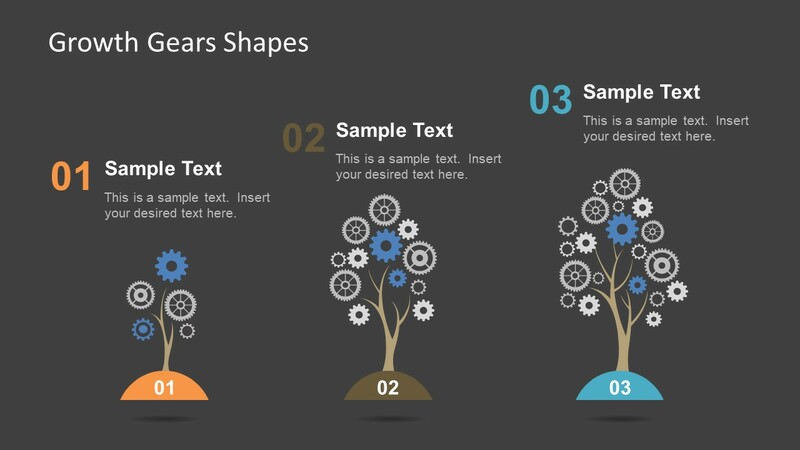 The editable template of Free Growth Gear Shapes for PowerPoint has two slides of gear icons on tree. 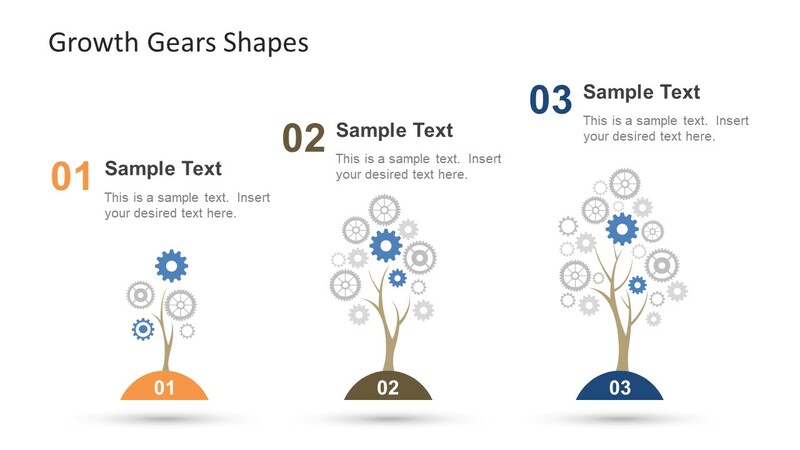 The three tree shapes represent continuous growth using number of gear icons. The placeholders for text appear organize in levels/stages to show step wise growth. For example, the first image with fewer gears demonstrates the start of a process. With time and effort, it develops into a rich productive stage and so on. The slides of PowerPoint have two backgrounds, black and white, as a choice to match template with other presentations. However, users can apply a desire background color from background option in design menu. This feature gives solid colors, gradients, texture and an option to add picture file. 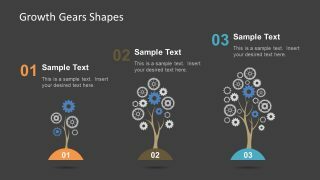 All the PowerPoint shapes of free growth gear template are editable, enabling users to select individual element and apply customizations. For instance, change color of gears or tree branches, move items to create more figures or resize and adjust image. This PowerPoint template is ideal for business presentations to show interconnection of ideas. Explain strategic growth of company, make a brilliant slideshow of lean startup or simple KPI reporting. Just few clicks can enhance the presentation with gear illustrations.